Balfour Yearbooks, the premier national provider of school spirit and recognition productions, acknowledged Stephen F. Austin State University's 2016-17 Stone Fort yearbook staff members for their outstanding contribution to scholastic journalism. Pictured, from left, are Rachel Clark, SFA coordinator of student publications and yearbook advisor, and Tyler Fisher, current graduate student who served as the 2016-17 yearbook editor-in-chief. 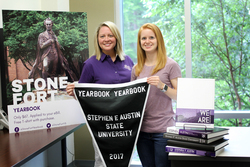 NACOGDOCHES, Texas - While its purpose may be to preserve history, Stephen F. Austin State University's 2016-17 Stone Fort yearbook has made history by being honored with a national award. Balfour Yearbooks, the premier national provider of school spirit and recognition productions, acknowledged SFA's 2016-17 Stone Fort yearbook staff members for their outstanding contribution to scholastic journalism, making them one of only 4 percent of yearbook staffs nationwide to receive this recognition. As part of this distinction, the 2016-17 Stone Fort yearbook will be featured in Balfour's 2018 Yearbook Yearbook, a collection showcasing the best in yearbook theme development, layout, photo content, secondary packages and cover design. Rachel Clark, SFA coordinator of student publications, serves as the publication's advisor and said she is proud of the students' accomplishment. "This recognition is a true reflection of the hard work and dedication that goes in to creating the publication," Clark said. "This was my first volume as yearbook advisor, which elevates the honor to a whole new level. It's exciting to watch the yearbook come together and to see the students take ownership in a publication that becomes part of the university's history." Current graduate student Tyler Fisher served as editor-in-chief and worked on the yearbook with four additional student staff members. "We worked hard to meet deadlines and produce a book that will be remembered by the SFA community," Fisher said. "I think we did a great job and worked hard to accomplish our goals." The yearbook ties its "The SFA Way" theme into various elements of the book, such as through photographs and articles. "My favorite part is the content," Fisher said. "The photos and imagery tell amazing stories and help make the book visually appealing." This yearbook is the 92nd volume in the university's history. The Texas Intercollegiate Press Association also recognized the yearbook for Overall Excellence in Division II Yearbook. "To some people, it's just a book they place on a bookshelf, but to the SFA Stone Fort yearbook staff, it represents long hours, event coverage, photos captured, copy created and deadlines met," Clark said. "Representatives from Balfour see hundreds of yearbooks annually, so it means a lot to have them honor ours and the work of our students."